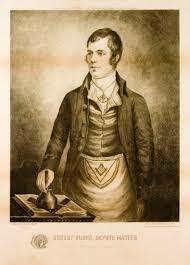 “Robert Burns in His Century and Ours,” by Andrew Calhoun, part of the on-going music and thought series for AIPCT. Robert Burns (1759-1796) has been beloved of (nearly worshiped in) North America, harboring so many of Scotland’s sons and daughters, and has been a pillar of the development of American music. Andrew Calhoun discusses the life and performs the works of Scotland’s bard, matching his songs to their original melodies—which, in some cases, have never been published with his lyrics. Both a lyricist and a folk song and ballad collector and editor, Burns’ achievement in songwriting is little understood. Well-known songs such as “Auld Lang Syne,” “Ae Fond Kiss,” “Flow Gently, Sweet Afton,” “A Rosebud by my Early Walk,” “Silver Tassie,” “My Heart’s in the Highlands,” etc., have had their tunes-of-composition replaced with melodies which miss the eloquent prosody of the originals. Burns has a signature style of songwriting, often matching the musical action to the subject rather than the verb. His songs were composed to existing melodies, many from Scotland’s rich country dance tradition, many by Scottish baroque composers James Oswald and Niel Gow. Andrew Calhoun is a renowned poet and singer songwriter from Chicago. He has a long history of scholarly engagement with the music of the British Isles. His book Warlock Rhymer, English Translations of Robert Burns’s Scots Poems, was published by Artemis Books in 2016. Andrew is currently working on a Robert Burns songbook, to be called Glorious Work, with 280 of the 420 songs with which his name is associated, sourced to their tunes-of-composition. The presentation will include performances of a number of Burns’s songs along with stories and history.